Is Music a Performance Art? Is music an art of performance or can it be something else? Most teachers, students and music lovers seem to agree: a musician performs. Or to put it another way: a musician must share their music with others, or they are not a real musician. Perhaps because music is an art form that only exists as sound in time, it certainly seems like a good argument. I want to sincerely and profoundly challenge the idea that music is by necessity a performance art. Are you any less of a musician if you improvise your own music on the spot for no one but yourself? Are you more of an artist if you can perform complex pieces for an audience but have no ability to create something of your own? In my personal history and experience with music, the audience has always played a central part in my learning. Not by choice though, but because my teachers held the idea that music must be performed. I love music. I love it because it is in the first place an art of expression. Not an art of imitation or, if we’re audience-centric, an art of affectation. But I have always felt this pressure that you’re not a ‘real’ musician until you play for an audience. And frankly, that’s just absolute nonsense. Music is something deeply personal. Music can be how you express yourself to yourself. You don’t HAVE to have an audience to enjoy music or be a musician. 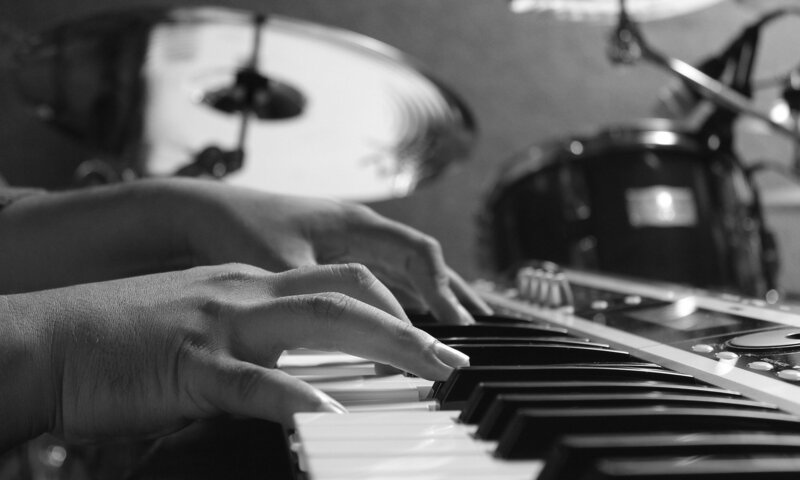 You can build your musical skills to very high levels and never perform. Maybe we need to rethink our priorities as teachers. The reality is that the vast majority of our students are not going to become professional, performing musicians. Or even performing hobby-musicians. Sometimes because they will find other interests in life, but often just because they don’t aspire to be on a stage. Does that mean we have failed in our job to create musicians? In our original definition of music as performance art: yes. But if we start teaching music as an art of expression, then it’s a resounding NO! Maybe we need to teach music for enjoyment and personal fulfilment FIRST. When music becomes a part of you, it’s something much more easily shared if the time is right. Then you introduce an audience. When the audience comes in at the time when the music is yours, you’re not just sharing for the sake of sharing; you’re sharing because you have a story to tell. And if a student never wants to share, then that’s fine too. If they can express themselves, through improvisation, through creating their unique interpretation of works, through composing their music, then we have done our job.